The power of writing and its obsessive hold over fan readers is a theme with which Stephen King is familiar. In Misery (1987) Annie Wilkes becomes increasingly psychotic after she reads a manuscript by the protagonist writer, Paul Sheldon, due to a sense of betrayal after she learns that the writer decides to dispense with his popular Victorian romantic heroine series and write a contemporary novel spiked with violence and profanity. In his most recent outing, Finders Keepers (Scribner 2015), King narrates the tale of two teenagers, set thirty-five years apart, a troubled Morris Bellamy and a generous Pete Saubers, who become enthralled with the Jimmy Gold novels by John Rothstein, a novelist who bears a strong similarity to J.D. Salinger. After Rothstein finished his trilogy that made him rich and famous, he retreated to a farm in New Hampshire where he refused to publish anything further prompting Time magazine in 1960 to acclaim him to be “America’s Reclusive Genius.” When Finders Keepers begins in 1978, rumours have circulated over the intervening years that Rothstein continued to write. When a high school teacher introduces the first volume, The Runner, to an alienated but bright student, Morris Bellamy, he becomes hooked and the book changes his life. Bellamy identifies with the anti-hero Jimmy Gold, who will remind readers of Holden Caulfield in Catcher in the Rye. Jimmy and the other characters that populate the novels are more human and real to Bellamy than any living person. But as he read the third novel, The Runner Slows Down, he becomes enraged because he considers Jimmy a sellout moving from New York to suburbia where he marries, has two children and works in advertising living a Mad Men, Don Draper-like, vacuous, philandering existence. The tipping point for Bellamy’s descent into a ruinous life is his professorial mother’s curt and sarcastic dismissal of the first two volumes, yet offering faint-hearted praise for the third, the one that her son despises. Leaving home, he slips into petty crime. After spending a year in a Youth Detention Centre, Bellamy hatches a scheme with two hapless accomplices to invade Rothstein’s farm, and steal his money and the notebooks of the unpublished writings that the writer has been squirreling away for years. Except for the last detail outlined above, King dispenses the rest of this material throughout the novel. In the first chapter, the ghoulish red-lipped Bellamy – “Red Lips” becomes an epithet to characterize him – carries out the home invasion where he kills Rothstein: a sellout does not have the right to live. Bellamy stashes all of the money and the over one-hundred notebooks in a trunk he buries near his mother's home. But before he can read one word of what's in the pilfered cache, he spends 36 years in prison for an unrelated crime. A few years before Bellamy is paroled, Pete Saubers, whose family lives in the same house where Bellamy once lived, stumbles upon the trunk and devises a scheme to financially assist his family without revealing its provenance. His parents have been cash-strapped since his disabled father, Tom Saubers, was seriously injured when the title character in Mr. Mercedes drove a car into a crowd of people at a work fair. But reading the notebooks are a transformative experience in Pete’s life. Already a good student, he develops a passion for literature, especially the writings of Rothstein. However, once Bellamy is out of jail, the only thing that has kept him alive in prison is the goal of turning his fantasy of reading the notebooks into a reality, which puts Pete in his crosshairs. 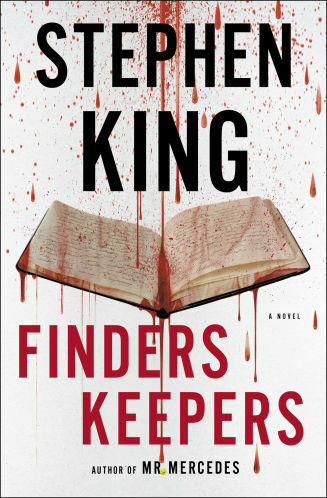 Finders Keepers is the second of a planned trilogy of hard-boiled mystery narratives without signs of the supernatural or paranormal as they follow retired Detective Bill Hodges. The 2014’s award-winning Mr. Mercedes was the first in the series, which pitted Hodges against Brady Hartsfield, the homicidal title character. (The final pages of the current novel tantalizingly suggest the direction of the future third.) In Finders Keepers, Hodges and his two young sidekicks, an intellectual prodigy, Jerome Robinson now a Harvard student, and an emotionally damaged but resourceful young woman named Holly Gibney, are relatively minor characters and do not even appear until the second half of the novel. When we meet Hodges for the first time on page 150, he is working on a case as a private investigator. These pages allow King to pay homage to Raymond Chandler’s Philip Marlowe, as John Banville did, writing under his pseudonym Benjamin Black, but much better in Black Eyed Blonde. King attempts to capture the tough-guy demeanour of the Marlowe-like Hodges, but I found a dip in the novel’s energy when our attention is diverted from the inevitable confrontation between the two major protagonists. Perhaps King is giving us a preview of the style he will employ in the concluding novel. Regardless, when King finds a hook to shoehorn Hodges into the larger narrative, the intensity of the novel accelerates. Once Bellamy has identified who possesses the notebooks, he will stop at nothing, including murder, to retrieve them. We know that Hodges and his team will do everything they can to thwart his goal, and save Pete and his family. Besides the suspense and the fast pace – two King trademarks – that drive the novel to its riveting conclusion, what perhaps is most interesting is King’s exploration of the doppelganger. Both Bellamy and Saubers share the same passion for Rothstein’s novels and notebooks. Bellamy has to know whether the third novel was merely an aberration and Saubers, who has already read the next two novels, is motivated to parlay his love of Rothstein’s fiction into his own writing career. But there is a fundamental difference between the two: besides not being a zealous psychopath, Pete knows what really matters, not the notebooks but the safety of his family – real people not characters on a page – and he is willing to sacrifice the one to save the other. He is also appalled that Bellamy would kill Rothstein merely because he did not like the direction that the writer took in his third novel. These two characters are not the traditional notion of the doppelganger since one is not the ghostly double of the other, but they are the mirror image of each other; one acts a foil for the other. 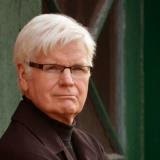 The utterly ruthless and predatory Morris Bellamy serves to clarify the humane values of Pete Saubers. To compensate for his blandly predictable suburban family life, Rush acquires an alter ego. Whereas Rush toils at his computer methodically, slowly plotting out each successive novel, his noir self "Jack of Spades" writes in longhand at a feverish pace after midnight fortifying himself with scotch, quickly churning out “cruder more visceral, more frankly horrific” violent potboilers. No one, not even his wife and children, knows the identity of the writer as he communicates only electronically with a different publisher. Rush is able to keep his respected public and darker private life separate until two developments occur. 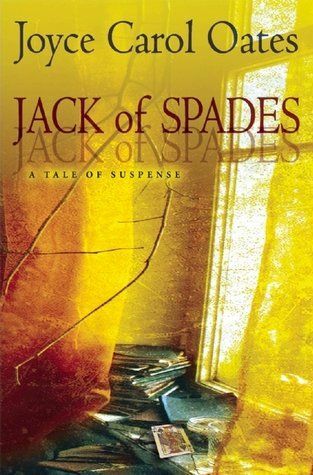 His grown daughter picks up a copy of a "Jack of Spades" book that Rush left carelessly lying around and finds it not only "gross" but disturbingly similar in plot to a childhood mishap which almost ended her life. A reader can surmise what happens in the novel. Secondly, Rush is the recipient of a bizarre plagiarism lawsuit from an unhinged reader, a local woman claiming he not only copied her ideas, but physically stole her work. While the even-tempered Rush is annoyed at being accused, he urges his lawyer to take no legal action when the case is dismissed but "Jack of Spades" bays for revenge, and Oates chronicles Rush’s slow descent into madness as his alter ego begins to take over his life. The voice of Oates’ Mr. Hyde becomes mocking and more insistent as the blandishments and rationalizations of "Jake of Spades" appear in italics. At one point, his wife enters his secret office – a room that she thought was only for storage – and wonders about the voices she is hearing. An agitated Rush quickly ushers her out of his private domain while angrily denying her queries, the first step in the disintegration of their marriage. "Jack of Spades" becomes an Iago voice suggesting that his wife is having an affair and that his family is a drain on his energies. Under the demonic power of "Jack of Spades," Rush is subsumed by his inner percolating impulses. The psychopathology that has operated beneath the surface throughout his life, which Oates gradually reveals, becomes more dominant as Rush increasingly begins to act like one of the nasty characters that he created in his "Jack of Spades" novels. Beyond the literary device of the doppelganger, what the authors of Finders Keepers and Jack of Spades have in common is that they share a love of literature. Besides the influence of Salinger, King’s novel evokes John Updike’s Rabbit novels, and Finders Keepers is studded with allusions to Joseph Conrad, Saul Bellow, Philip Roth and Emile Zola. In his English class, Pete reads D.H. Lawrence’s story, "The Rocking-Horse Winner," and it deeply resonates with him given its message that “money from nowhere almost always spells trouble.” Oates’ ability to cross genres from historical romances, contemporary social problems, young adult fiction, and in particular the Gothic, is well known. The Gothic influences, which inspired Jack of Spades, are specifically mentioned, especially the short stories and novels of Edgar Allan Poe that are not only enumerated but are integrated into the plot. Both novels explore the power of literature over its readers or over writers themselves and their fictional counterparts. Literature can inspire readers to the better angels of their nature or serve as a cautionary warning that authors or their books can become a source of pathological fixation.